The concept of ‘fair trade’ has been around for over 40 years according to Fine but a formal labeling plan didn’t get off the ground until the late 1980s. 1988: launch of the first Fairtrade label, Max Havelaar, under the plan of the Dutch development agency Solidaridad. The first ‘Fairtrade’ coffee from Mexico was selling into Dutch supermarket. It was recognized "Max Havelaar," after a fictional Dutch character who opposed the exploitation of coffee pickers in Dutch colonies. Late ‘80s/early ‘90s: The Max Havelaar plan is replicated in several other markets across Europe and North America “Max Havelaar” “Transfair” “Fairtrade Mark” in the UK and Ireland, “Rättvisemärkt” in Sweden, and "Reilu Kauppa" in Finland. 1997: Fairtrade Labeling Organizations International (FLO) was recognized in Bonn, Germany to unite the labeling initiatives under one umbrella and establish international standards and certification. 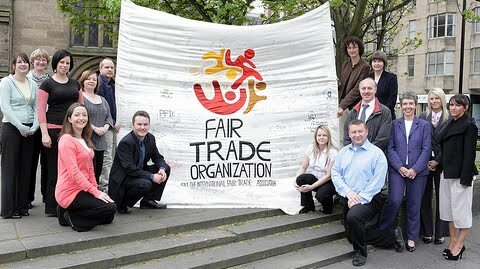 2002: FLO launches a new International Fairtrade Certification Mark. The goals of the launch were to improve the visibility of the Mark on superstore shelves, facilitate cross border trade and simplify export events for both producers and exporters. 2004: FLO splits into two independent organizations: FLO International, which sets Fairtrade standards and provides creator business support, and FLO-CERT, which inspect and certifies producer organization and audits traders. 2006: The Fairtrade Certification Mark harmonization process is still under way – today, all but three Labeling Initiatives have adopted the new International Fairtrade Certification Mark. Full change to the new Fairtrade certification Mark should become realism as it slowly replaces the old guarantee marks at various speeds in various countries.